For whatever reason, levity on the economic and employment fronts is a little hard to come by today. Maybe it’s because all the humorists are taking the day off. Maybe it's because the New York Times set the stage with some particularly depressing scenery this morning: the news that Congress has not yet approved an extension of insurance payments for the long-term unemployed in New York state. That, says the Times, "will leave about 37,000 residents of the state … without benefits this week, and will force others to contemplate applying for food stamps or other forms of welfare that they had never considered." Admission: Free (but there is a charge for parking). If you don't live near Chicago, not to worry; we'll be back with a full roundup of coming fairs around the country on Thursday. 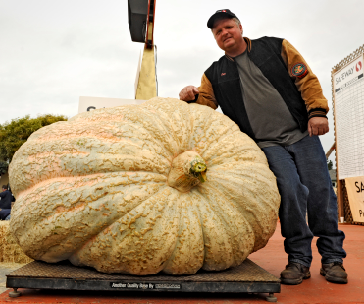 Until then (or until tomorrow, anyway), here's a little something to cheer you up: a 1,658 lb pumpkin. What’s that you say? You're not sure how that's supposed to cheer you up? Well, you could come away refreshed by the thought that nature and all its wonders just continue rolling along without any regard for the trials and tribulations of human kind. Or, you could reflect that that one pumpkin is approximately the size of seven members of an average NFL defense, or a mere 150 pounds lighter than a Smart car. Or, if you're into making yourself feel better through good old schadenfreude, why not reflect on the fact that your job doesn't involve either a) growing giant pumpkins or b) taking pictures of them. There, feel better? Thought so. Could Blogging Cost You Your Unemployment Check?